This guide will show you how to fix a tear in leather. The same procedure applies to tears in all type of leather: furniture, car interior, clothes and all other leathers. 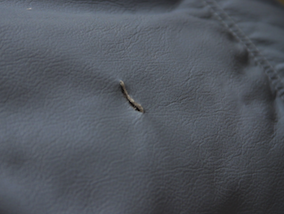 This photo shows a tear in a panel from a leather sofa. To fix the tear you will need the following products. The tear we are fixing is no larger than a tennis ball, so we have chosen the small area bundle that includes the Leather Repair Touch Up Kit. If the damage covers an area larger than a tennis ball, you would need the large area bundle, that includes a Leather Colorant Kit. The process for both sizes are the same, the only differences are the volume of color used to cover the repair and the tools used to apply it. 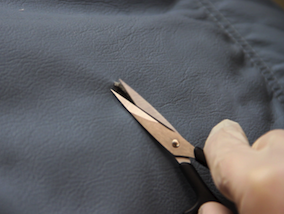 The next step is to take a scalpel or a pair of sharp sciscors and trim the worn edges off the tear, making for a cleaner edge and smarter repair. If repairing a large area, using the large area bundle, at this stage you will need to apply Leather Prep from the Leather Colorant Kit and then alcohol clean the tear and the surrounding leather. This cleans the surface making the color (later applied) adhere better. This is not required if only repairing a small area however. 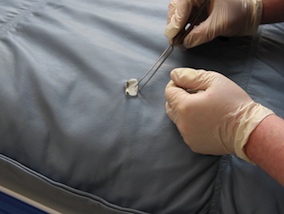 Using the tweezers and canvas cloth supplied in the leather repair kit. Insert the cloth behind the tear. Once the cloth is behind the leather, use the spatula included in the Leather Repair Kit to apply the Leather Glue onto the underside of the leather. Basically - put the glue inbetween the cloth and the leather. 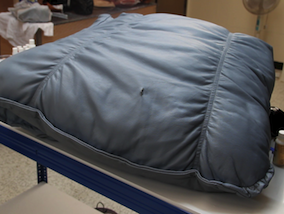 Press the leather down onto the cloth once the glue has been applied to all the edges and leave it to dry. This technique re-creates the backing of the leather making for a very strong repair. 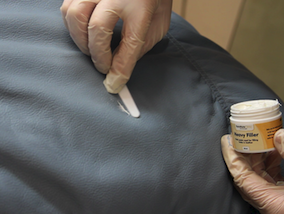 The next step is to apply the heavy filler into the tear. This will fill the gap in the leather making it level with the rest of the leather. The filler is applied in several thin layers and a grain pattern can be embossed into the final layer to further blend the tear in with the rest of the leather. Apply one thin layer to start with and then dry it off with a hair drier for a few minutes. Repeat this process until the tear is about 3/4's full. Then apply one last layer to the tear and smooth it off with the palette knife making it level with the leather. For a perfect repair you can use a Grain Pad to emboss the grain pattern into the filler. Alternatively, you can use Grain Repair to manually recreate the grain before applying color. When the filler is dry, the next stage is to apply the color. To do this, simply take the colorant and apply a small amount to a sponge. Use this to apply the colorant to the repair, blending it with the surrounding leather. 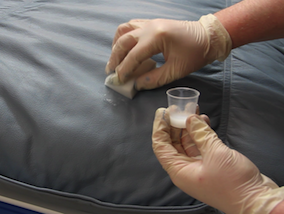 If using the large area bundle, after applying the first layer of colorant with a sponge, the remaining layers should be sprayed on using the airbrush. Apply the colorant in multiple thin coats, allowing time for each to dry before moving on to the next. Apply as many coats as it takes to conceal the repair. When the repair has been colored sufficiently and the colorant has been left to dry, the final stage is to applly the finish. If using the small area bundle, this can simply be applied using a sponge, again in multiple thin layers, allowing time for each to properly dry before moving on to the next. If using the large area bundle, you should apply the finish using the airbrush. 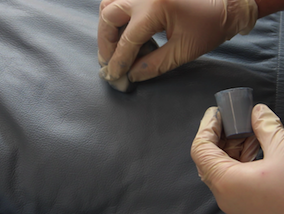 Applying the glossy superseal first, in 3-5 layers, before moving on to spray on the Leather Finish. Around 8-10 coats of finish should be sufficient to ensure a good, robust repair. Thank you for your message. Unfortunately when the Leather Degreaser is not sealed and stored properly after use, it does run the risk of drying out and you would not be able to add anything to moisten. 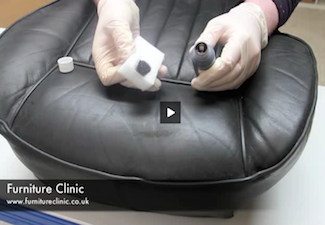 However, we would be happy to help you replace the Leather Degreaser and advise you on your leather restoration if you can email us a few photos to help@furnitureclinic.com so we may advise you further. 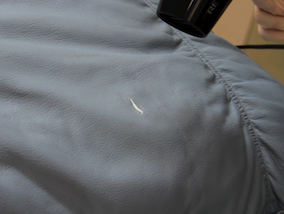 I have Bead on a Leather chair that has warn off to the bead, about 1" x 1/8 " hole,leather missing .How do I fix that ?Help ! Thank you for your email. 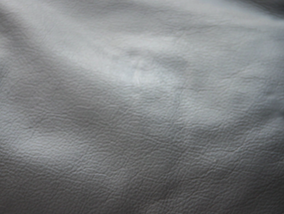 We would be happy to help you restore your leather cushion but we require a bit more information from you so we may provide you with the proper products to restore your leather. 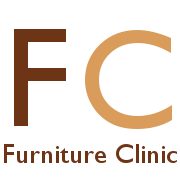 Would it be possible to send us a couple of photos to help@furnitureclinic.com so we may ascertain the damage and advise you properly. We look forward to hearing from you. Is the repair kit applicable to the louis vuitton bag particularly the leather part of Alma style. Thank you for your question. 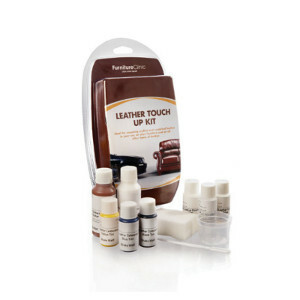 The Leather Repair Kit can be used on any leather type in terms of repairing the tear itself. The difficulty you may have with a designer bag is if the tear is in any area with any designer pattern as this may be hard to recreate yourself. If it is in an area of plain leather then this would be quite straightforward for you to do.